Ships of the Essex Amphibious Ready Group docked at Naval Base San Diego Tuesday following a seven-month deployment to the Middle East and western Pacific. The amphibious assault ship USS Essex, amphibious transport dock USS Anchorage and amphibious dock landing ship USS Rushmore unloaded members of the 15th Marine Expeditionary Unit at Camp Pendleton on Sunday. Helicopters of the Helicopter Sea Combat Squadron 21 flew to Naval Air Station North Island on Monday. 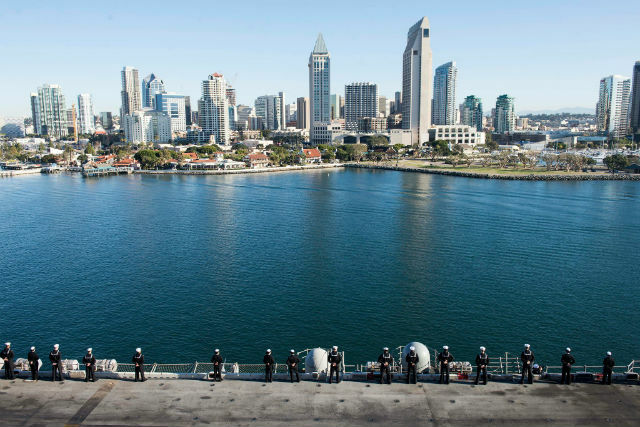 The 4,500 sailors and Marines in the Essex ARG returned to San Diego just in time for the holidays after conducting a variety of missions in the Middle East and Pacific Ocean after leaving San Diego May 11, according to the Navy. “The distinct ability of amphibious forces to gain access to critical areas anywhere in the world with ground, air, and logistics forces enables the Navy-Marine Corps team to shape actions across the range of military operations, to resolve conflict, conduct humanitarian assistance, or combat the enemy in remote, austere environments that would otherwise be inaccessible,” said Marine Col. Vance Cryer, commander of the 15th MEU. The “Smokin’ Aces’ of Helicopter Sea Combat Squadron 21 Detachment 1 flew more than 1,600 hours of flight operations in the MH-60S Seahawk throughout the deployment. The voyage was marred by a pair of incidents early in the deployment. On May 17, a Marine died and 21 were injured when a tilt-rotor MV-22 Osprey operating off the Essex made a hard landing at a training area in Waimanalo, Oahu, Hawaii. Near the end of June, 38-year-old Senior Chief Petty Officer Jason May of Chesterfield, Michigan, collapsed and died after experiencing chest pains aboard the Essex.